The Messier marathon is a bucket-list observing challenge for amateur astronomers. During a single night in early spring every year, it's possible for skywatchers in mid-northern latitudes to see all 110 objects in Charles Messier's list of celestial showpieces. The marathon requires some advanced planning, and mobile apps are a terrific resource for this. 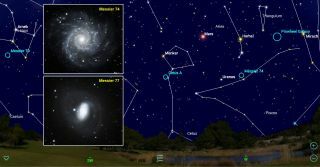 The first two objects to observe, the galaxies Messier 74 and 77, set soon after dusk. Their locations are shown here for 8 p.m. local time on the moonless night of March 6, 2019. French astronomer Charles Messier's list of the best and brightest deep sky objects is popular with skywatchers of all experience levels. During the new moon period in early spring each year, it's possible to observe every one of the 110 objects in a single night. For many amateur astronomers, this observing challenge is a bucket list item known as the Messier marathon. This year, both March and April offer periods to run the Messier Marathon. In this edition of Mobile Astronomy, we'll tell you what equipment you'll need, when to attempt the feat, the optimal order to view the objects, and how to use mobile astronomy apps for planning and recording your observations. And if you aren't quite ready to tackle the entire list all at once, you can slow down and enjoy many of Messier's delights at your leisure. What is the Messier List? In 1705, English astronomer Edmond Halley calculated that the bright comet that now bears his name would return around 1758 — and astronomers scrambled to be the first to spot it. At the time, Charles Messier was a junior astronomer working at the Marine Observatory at the Hotel de Cluny in Paris. In mid-1757, he began searching for the comet in the areas of the sky most likely to contain it. When still far from the sun, comets appear as dim, fuzzy objects that move rapidly across the distant fixed stars from night to night. On Jan. 21, 1759, Messier finally found Halley's Comet — but he was scooped by a German astronomer who had glimpsed the object a few weeks beforehand. Now hooked on comets, Messier continued searching for undiscovered comets by sweeping the skies on clear, moonless nights. His 4-inch (100 millimeters) aperture telescope was only slightly larger than most beginner telescopes in use today. But he had the benefit of skies that were untouched by today's urban light pollution. Charles Messier (1730-1817) compiled his catalog of uncharted, comet-like "nebulas" between 1758 and 1781. The French Academy of Sciences published the list for the benefit of the comet hunters of the day, but modern amateur astronomers still delight in its treasures. The first page of the catalog's third edition, showing Messier objects 1 through 5, is presented on the right. Other than the prominent stars labeled on the published paper atlases at that time, the night sky was still largely uncharted then. The sky was still largely uncharted then, except for the prominent stars labeled on the published paper atlases. On Aug. 28, 1758, Messier spotted a possible comet in the constellation of Taurus, but when it didn't alter its position, he knew it was permanent feature of the deep sky. He decided to catalog these uncharted "comet imposters," starting with this first object, which we now know as the Crab Nebula, or Messier 1. More faint fuzzy objects followed. In 1771, after compiling descriptive notes and coordinates for 45 objects, Messier submitted the list to the French Academy of Sciences, and it was published in 1774. Messier and his contemporaries Pierre Méchain, Barnabus Oriani and Nicholas Louis de La Caille continued to contribute objects. Their final list, published in 1784, contained 103 objects. Between 1947 and 1967, astronomers Helen Sawyer Hogg, Owen Gingerich and Kenneth Glyn Jones added seven more objects that were mentioned in Messier's notes, but never included — arguing that he either forgot them or had planned to add them later. Every astronomy sky-charting app includes the list of 110 objects, referring to it as the Messier list or Messier catalog. The objects are designated by their "M-codes, M1 through M110 (or Messier 1 through Messier 110). Amateur astronomers commonly refer to the group as the Messiers. Most of these famous objects also have proper names, such as the Whirlpool Galaxy (M51), the Pleiades (M45) and the Beehive Cluster (M44). Your app might be configured to display the proper names instead of the numbers. A gallery of all 110 deep-sky objects in the Messier list, starting with the supernova remnant Messier 1 at upper left: The collection includes a sampling of nearly every type of deep-sky object, such as galaxies, nebulas and star clusters. Images like these are a helpful preview of what you will see in a telescope, although your eyes won't detect the colors. All but two items in the Messier List are deep-sky objects — a label that covers any celestial object outside our solar system that isn't an individual star or a small multiple-star system. Broken down by type, the list contains 40 galaxies, 57 star clusters, nine nebulas, the Crab Nebula supernova remnant, a rich patch of Milky Way stars, a double star and a multiple star grouping. It's not clear why Messier chose to include the last two non-deep-sky objects, why he included several objects that don't resemble comets or why he left out other comet-like objects he would have easily seen from Paris with his telescope. The objects in Messier's list are distributed throughout the night sky visible from midnorthern latitudes. None of the objects are in the area between Pisces and Aquarius, so when the sun moves between those constellations in late March every year, it allows skywatchers to see all of the Messier objects between dusk and dawn. The idea of a running a "Messier marathon" originated in 1979 with another comet hunter, Californian Don Machholz. The most southerly Messier objects are in Scorpius and Sagittarius, and the most northerly objects are in Cassiopeia and Ursa Major. For this reason, you can see all 110 objects only from locations on Earth between about 20 degrees south and 55 degrees north latitude, worldwide. Observers in the Southern U.S., around 25 degrees north, have an advantage for viewing the objects observable only after dusk and before dawn. This is because the sun rises and sets more vertically near Earth's equator, offering shorter twilight periods. To see the fainter Messiers, pick a moonless night within a day or two of the new moon. In 2019, a new moon occurs on Wednesday, March 6 and again on Friday, April 5. A clear sky all night long is a must, so check the forecast and choose the night that offers the best conditions. If more than one night looks promising, make your attempt on the first night, so you have the option for a second try. And if March doesn't work, try again next month. Messier's objects are distributed around the portions of the night sky that were visible from the astronomer's home in Paris. None of them fall between Pisces and Aquarius. When the sun lands there in late March every year, all of the Messiers become observable between dusk and dawn around the new moon. Astronomy apps include the Messier list objects. The SkySafari 6 app allows you to select and highlight the Messier objects and sort the list in various ways (inset). Pick an observing site free from direct lights and light pollution, with open sight lines to the horizon, especially to the west and the southeast. To improve your site selection, use your app to preview where the objects will be during the night, especially the ones that will be observed when they're near the horizon. A site at higher elevation will also give you more time to observe the low objects. Bring warm clothes, and stock up on snacks and drinks — you'll be awake all night! Many Messier objects are visible in binoculars — 10 x 50 binoculars make a good compromise between weight and performance. The dimmer objects will require a telescope. A 3-inch-diameter (80 mm) telescope will work under very dark-sky conditions, but a larger-aperture telescope will make the fainter objects easier to see during twilight. The smaller your telescope's focal ratio (F/n) is, the wider its field of view will be, making the search easier. Low-power, wide-field-of-view eyepieces are recommended — you won't be zooming in on the Messiers much, anyway. Consider using a non-magnifying finder accessory for your telescope. Telrads and Rigel Kwikfinders project a glowing bull's eye onto a small window, allowing you to aim your telescope precisely where the object should be. Be sure to set up your telescope and organize your other equipment well before sunset. If you are using a GOTO telescope, align it in advance and be sure to have an adequate, long-lasting power source for it. If you can't star-align the telescope before sunset, consider running your marathon by getting up in the wee hours of the night, say 2 a.m. local time, and observing the morning objects. Then, leave the telescope aligned all day and resume your session at sunset. You'll still have run your marathon within 24 hours. You can use SkySafari 6 or another sky-charting app to plan your observations and find out more about each object, such as its type (nebula, star cluster, galaxy and so on) and how it will look. The app's object database will include a separate listing for the Messier objects. If you plan to find the objects in the sky without using a GOTO telescope, you will need to note the bright stars near each object. Then, starting at a visible star, scan across the sky while moving in a direction toward the Messier object. Don't forget that most telescopes invert or flip the view, so directions might be reversed in the eyepiece. In the SkySafari 6 app, open the Search menu and tap Messier Objects. By default, the display order is by Catalog Number. For the marathon, I recommend switching to Set Time. The app will order the list so that the first objects to set are at the bottom, so scroll down and work upward. When an object has set, the list will be reordered, leaving the next objects at the bottom. Entries for objects currently above the horizon will be bolded, so set the app's date and time to when you will start observing. If you wish to see the objects highlighted on a map of the sky, tap List Settings and enable Highlight Objects. Blue circles will be drawn around every Messier Object. As you find and view each object, note the time and the equipment you used. If you have time, jot down a few impressions. It's helpful to have a printed checklist to cross off objects and ensure that you don't forget to observe an object before it sets for the night. Many of the Messier objects, such as Messier 45 (at top center left, also known as the Pleiades), are bright enough to be seen using binoculars or unaided eyes. Other objects require a telescope of at least 3-inch (80 millimeters) aperture. Bright stars can guide you to many objects. For example, Messier 34 is located about midway between the stars Algol and Almach. The sky is shown for skywatchers in the northeastern U.S. at 8 p.m. local time. The Telrad accessory (inset) allows you to quickly locate celestial objects. We can learn plenty from the experience of astronomers who have carried out Messier marathons in the past. Here's a website with a recommended viewing order. The objects aren't ordered simply by their setting time, because brighter objects can be picked out during twilight, while dimmer objects need more darkness. Be careful not to confuse the viewing order with the Messier number. To start your marathon, you will need to quickly catch the objects that set in the west after sunset — specifically the dim galaxies M77 and M74. By the time the sky has grown dark enough to see these galaxies, they will be low in the west. It's a good idea to limit the time spent on the first galaxy so as not to miss the other one. Immediately after viewing those two, find M33, the large, face-on spiral galaxy in the constellation Triangulum, and then the Andromeda galaxy trio of M31, M32 and M110. From this point, you will have time to work your way systematically across the sky from west to east. As you do so, more objects will rise in the east. By late evening, you should arrive at the Virgo Cluster of galaxies. When you have viewed the 17 objects there, you can take a break until the next group of Messiers rises into view, at around 3 a.m. local time. The final wave of objects includes M55, M75, M72, M73 and M2, which rise in the predawn. The last object, the globular cluster M30, will rise in the east as dawn starts to break — so it will be a challenge to see this object. Observers in the south will have an advantage here. After you spend a long night of Messier hunting, the final object, the globular star cluster Messier 30 (bottom center), will rise shortly before the sun. Ensure your observing location has a low southeastern horizon, and use your astronomy app to predict the exact direction at which the object will appear. The sky is shown for skywatchers in the northeastern U.S. at 6:45 a.m. local time. Southern U.S. observers will benefit from having a shorter twilight period. And that's it! Whether you run the entire Messier Marathon, fall a wee bit short or just sample a portion of it, you'll enjoy a wonderful adventure under the stars, seeing the best that the night sky has to offer. And, hey — there's always next year! Several astronomy organizations will recognize your achievement if you observe all of the Messier objects, even if you didn't view them all in one night. The Astronomical League will send a Messier Program Certificate to members-at-large or members of affiliated astronomical societies who provide observational notes for 70 objects found without a GOTO telescope. The organization will send a lapel pin and honorary membership certificate for completing the entire list (over any time frame). The Royal Astronomical Society of Canada will issue an RASC Messier Certificate to members who complete the list and provide documentation. The group recognizes both the GOTO and manual approaches. Both organizations' websites have information and observing forms to download and print out. In a future edition of Mobile Stargazing, we'll look at spring galaxies, recreating the Apollo missions in this 50th anniversary year and more. In the meantime, keep looking up! Editor's note: Chris Vaughan is an astronomy public outreach and education specialist at Discovery Planetarium and AstroGeo, a member of the Royal Astronomical Society of Canada, and an operator of the historic 74-inch (1.88 meters) David Dunlap Observatory telescope. You can reach him via email and follow him on Twitter @astrogeoguy, as well as on Facebook and Tumblr. This article was last updated March 6, 2019. This article was provided by Simulation Curriculum, the leader in space science curriculum solutions and the makers of the SkySafari app for Android and iOS. Follow SkySafari on Twitter @SkySafariAstro. Follow us on Twitter @Spacedotcom and on Facebook.